Refreshing is the word that kept springing from my mouth when I first tasted my Apple Salad dish and when I described it to my hubby and son. I have been thinking about light and refreshing dishes quite a bit lately since warmer weather has crept into my life. During warmer weather I don’t feel like making heavy or complicated meals. Summer is the time when I am looking for quick recipes and dishes that don’t make me tired or lazy after eating. My Apple Salad recipe is all the things I just mentioned. It is quick to make. It is light and refreshing. Plus, it does not make me feel heavy, bloated or lazy after eating it. On the contrary. I actually feel energized after eating this salad. Apple Salad is packed with protein from the delicious chopped walnuts and golden raisins and has vitamin C from the apples. Another plus is that the raisins contain antioxidants which helps our bodies to fight against cancer and heart disease. Also, the raisins add a hint of sweetness to counter the tartness of the apples. 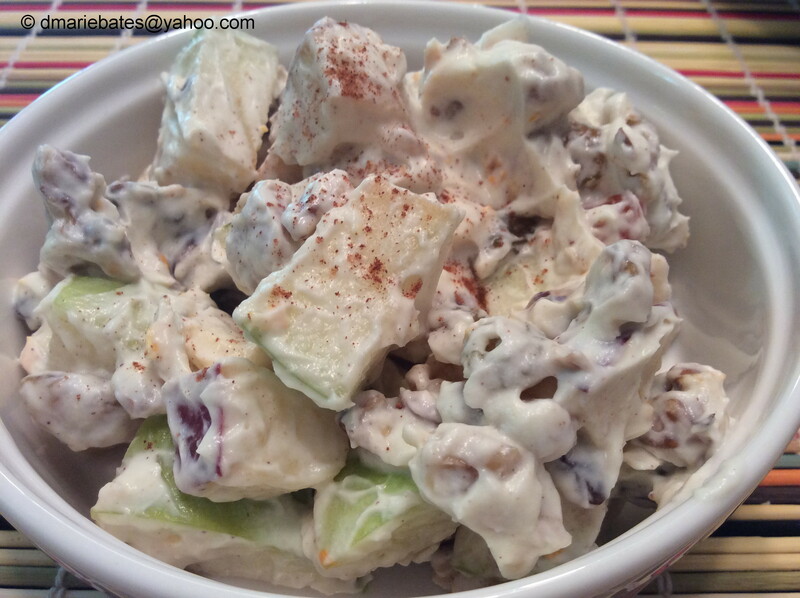 Bottom-line… Apple Salad is a low calorie, healthy dish that will leave you feeling refreshed and energetic. Just ask my son. He liked this salad so much that he had it for breakfast and as a snack. 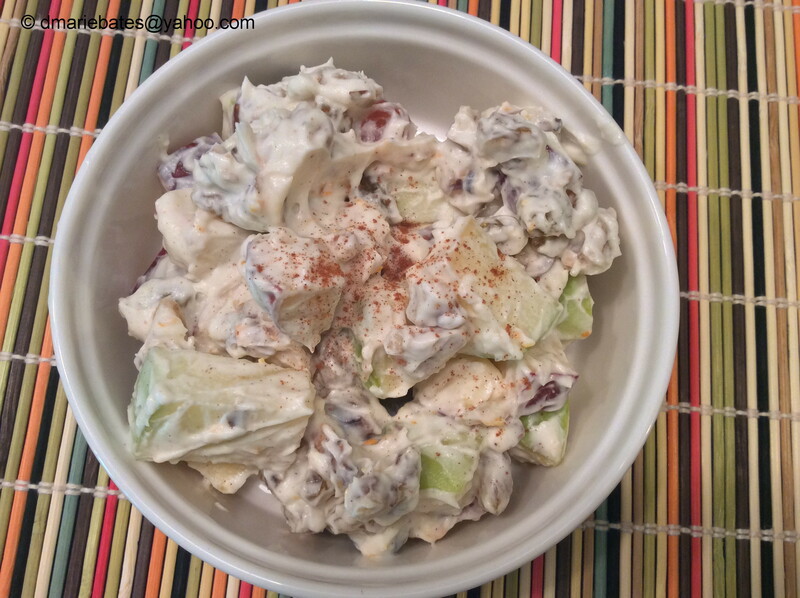 If my biggest critic loved my Apple Salad, I think you will too. Place apples in a large bowl and squeeze lemon juice over apples then toss. This will keep the apples from turning brown. Set asides. In a deep bowl add marscapone cheese, sour cream, milk and sugar. Beat with a hand mixer until smooth. Add vanilla, nutmeg and cinnamon. Beat until seasonings are incorporated into mixture. 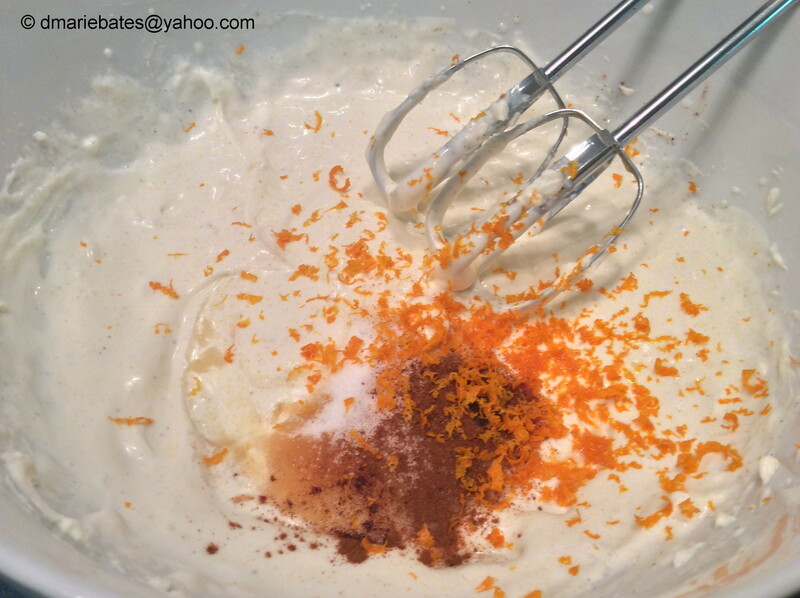 Stir in orange zest. Pour mixture over apples then add walnuts and raisins. 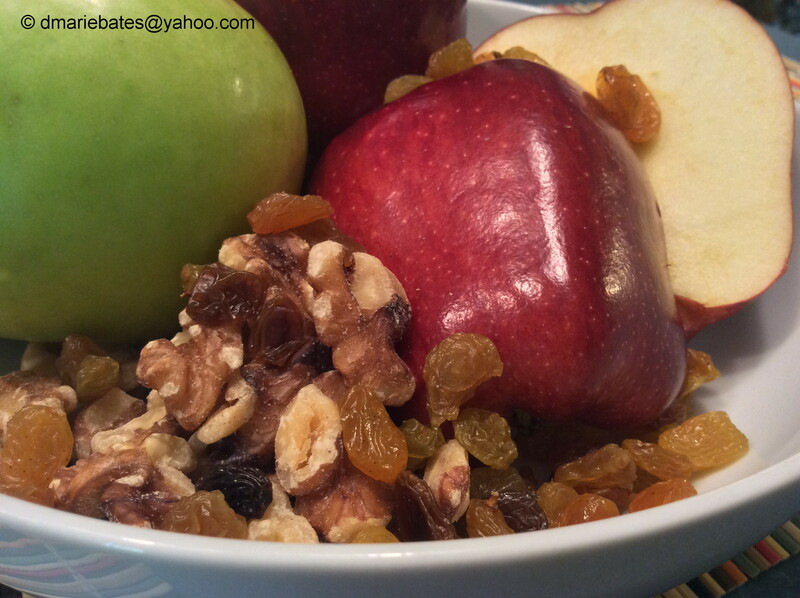 Gently mix until the apples are well coated along with the nuts and raisins. Serve chilled or at room temperature.